Why is it not accepting my camper’s birthday? 1) Enter the birthday as Jan-03-2005. Do not enter Jan-3-2005 or Jan-03-05. 3) Months must be entered as 3 letters only not 4. September must be Sep not Sept and July must be Jul not July. Discount codes are entered on the Session Selection page not at the checkout. We realize that camp can be expensive, especially when you are registering your whole family or for more than one week. To help with the cost we offer the Sibling Discount. Depending on how many campers or how many weeks you are registering for will determine the size of the discount. All children must be immediate family members. 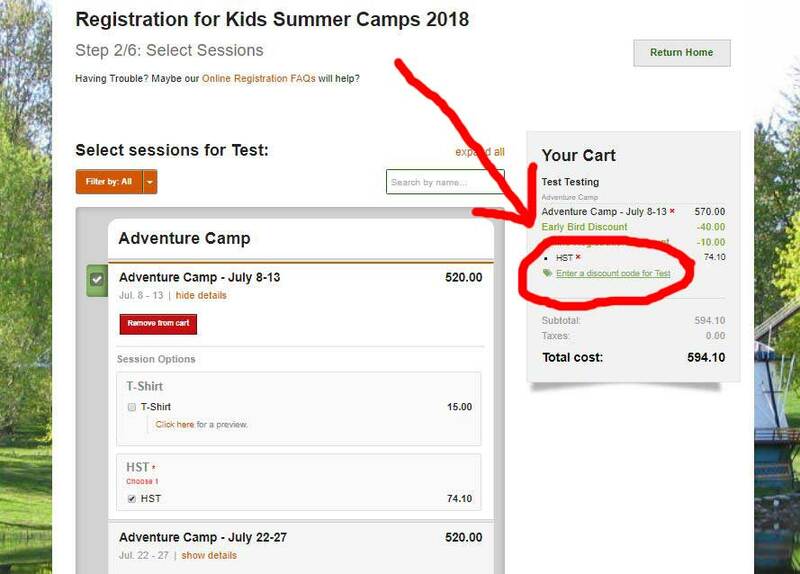 The online registration system will automatically apply the discount when you register more than camper in your household. Why does the price seem to be more than it should be? All of the prices in the system are correct. The price in the “Select Session” area on the left shows the price with the discounts already taken off. The early bird and online discounts are automatically taken off the price and that is the price you see in the “Select Session” area . In the “Your Summary” area on the right it will show the full price and then give you a breakdown of the discounts. Tax is charged on the full amount. Where do I get my receipt? If you registered online, log back into your online account, click on “View Registration Details” under “View my Completed Registrations”, then click on “Download Printable Season Account Statement”. Will a confirmation letter be mailed to me? A confirmation will be sent to you via email immediately following your registration. All the confirmations and receipts can be downloaded in your online account. Log back into your online account, click on “View Registration Details” under “View my Completed Registrations”, then click on “Update Household Information”. Unfortunately you are unable to change other information like cabin mates or medical information. If you would like to change that information please call or email the office and let us know the changes. When filling out forms, what is the difference between submit and save changes? Save changes will save the progress you have made on the form. You can then log back in and continue to work on the form later on. You will not be able to continue to the next stage of the registration process until you submit the form. Submitting the form sends your info to our database. After I choose ‘pay by cheque’ can I make a payment by credit card? Yes. This is only available for Special Needs Programs. Log back into your online account, click on “View Registration Details” under “View my Completed Registrations”, then click on “New Payment”. Then you can pay by credit card. Call or email the office and talk to Kim at 1-888-226-7722 x1x1. The per-session 1/2 fee deposit is non-refundable for cancellations made after May 14th. For cancellation prior to May 15th, there is a $50 cancellation fee.